Size: 19 3/8 x 22 7/8 inches. from ''A New General Atlas,'' Lon: c.1721. 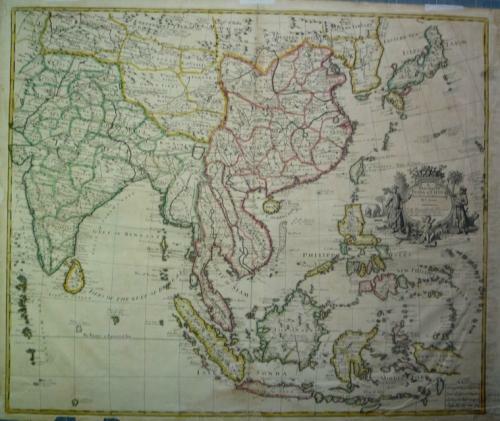 Early outline hand-coloring, Most of southern Asia including part of Pakistan, Japan, Formosa, western New Guinea, the Phillippines. Uncolored cartouche with angel, tiger, monkey, and elephant. In average condition with repairs on verso to both sides, two chips in lower margin, short tears in margins, few areras of light stain.